On Sunday, May 14, 1961—mother’s day—scores of angry white people blocked a Greyhound bus carrying black and white passengers through rural Alabama. The attackers pelted the vehicle with rocks and bricks, slashed tires, smashed windows with pipes and axes and lobbed a firebomb through a broken window. As smoke and flames filled the bus, the mob barricaded the door. “Burn them alive,” somebody cried out. “Fry the goddamn niggers.” An exploding fuel tank and warning shots from arriving state troopers forced the rabble back and allowed the riders to escape the inferno. Even then some were pummeled with baseball bats as they fled. After news stories and photographs of the burning bus and bloody attacks sped around the country, many more people came forward to risk their lives and challenge the racial status quo. 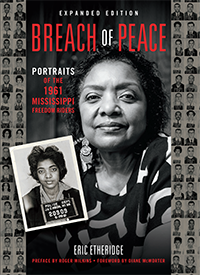 Now Eric Etheridge, a veteran magazine editor, provides a visceral tribute to those road warriors in Breach of Peace: Portraits of the 1961 Mississippi Freedom Riders. The book, a collection of Etheridge’s recent portraits of 80 Freedom Riders juxtaposed with mug shots from their arrests in 1961, includes interviews with the activists re-flecting on their experiences. A high school teacher at Kirkland, Washington, I was recruited by the American Federation of Teachers to go to Mississippi and set up a freedom school. They sent me by Greyhound Bus to Jackson, Mississippi. After extensive training in nonviolence, I marched with Student Nonviolent Coordinating Committee Regional Director Stokely Carmichael on the streets of Jackson protesting racial inequality. I was incarcerated in the main pavilion of the state fairgrounds and was harshly beaten. Later I went to Amite county and set up a freedom school. One of my students of the son of Herbert Lee who was shot by State Congressman Hurst for rallying others to register to vote. I was instrumental in registering 35 blacks to vote; the only black residents of that county who had ever registered. I wrote a lengthy article of my experience focusing on Herbert Lee, E.W. Steptoe and Bob Moses. However, I have not been able to get it published. I would greatly appreciate it if someone would provide me with a copy of my Jackson police mug shot. I would appreciate a copy of my Jackson police mug shot.